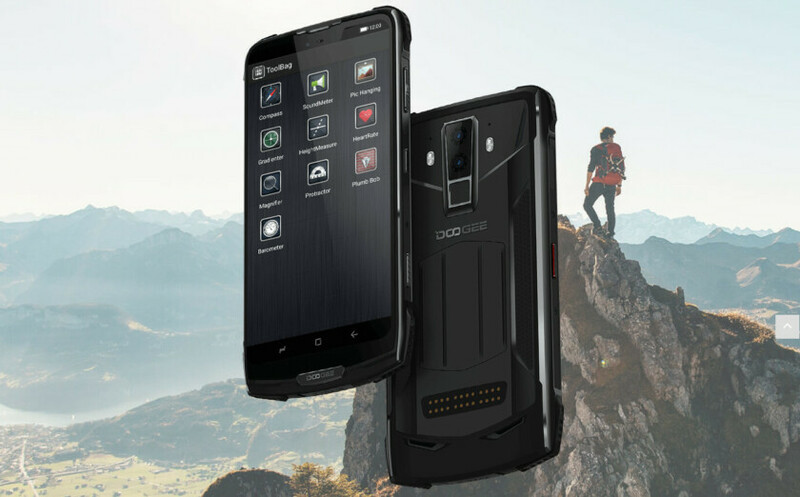 Home Reviews Doogee S90 review: The James Bond phone? 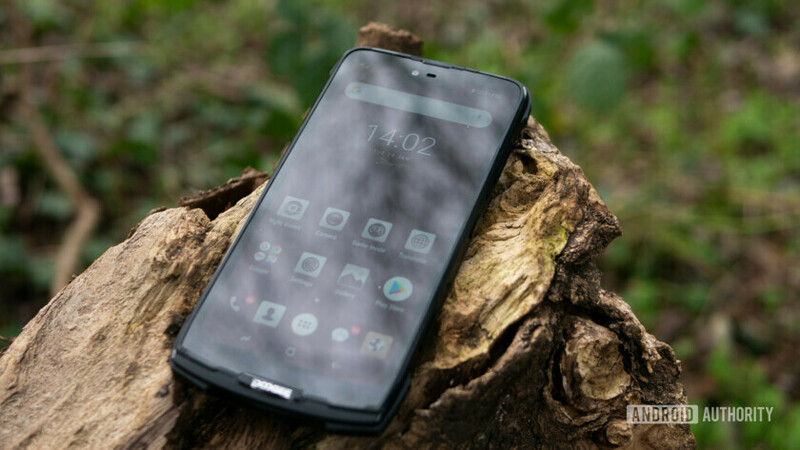 I love getting to review a smartphone that tries something a bit different, and the Doogee S90 is exactly that. It looks like a brick (not necessarily in a bad way), it comes in a massive box, and also sports a variety of bulky components that attach in a modular fashion. Unboxing this thing I felt like James Bond assembling a sniper rifle from a briefcase, or trying out the latest gadgets from Q. Even the name is different. 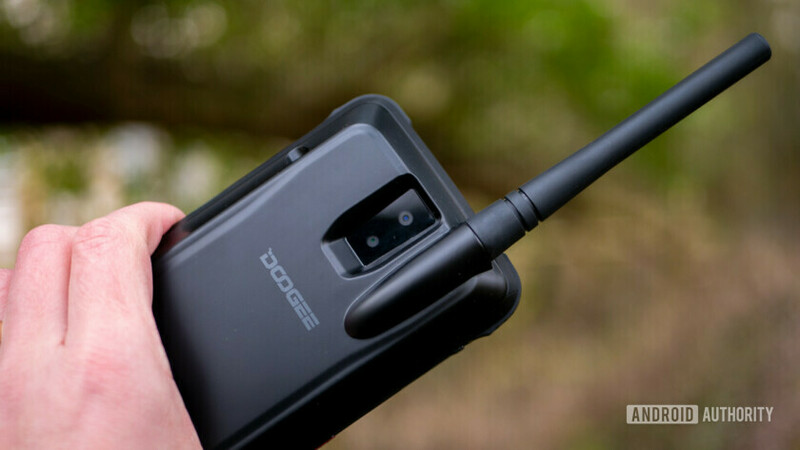 Doogee sounds a little close to “dodgy”, but we’ll overlook that. 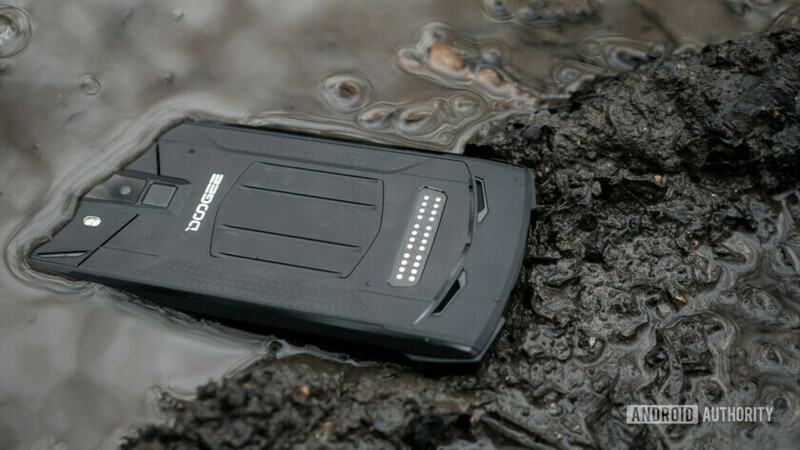 Doogee isn’t actually a new company though, and has been around for a little while and made a name for itself creating some unique devices. 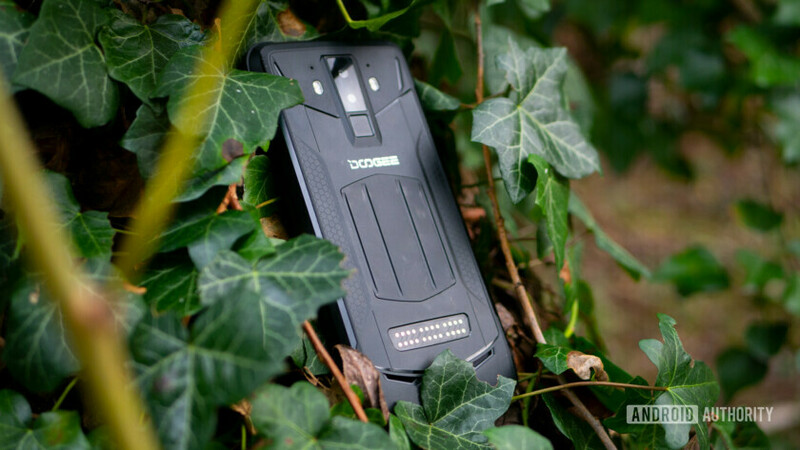 The Doogee S90 – like a lot of other more unusual technology these days – began life on Kickstarter. In fact, the campaign is still live with a while to go at the time of writing, and is currently at 2,642% funded. That would be success story by anyone’s standards, though the funding target was very low, at $10,000. But is it just a gimmick, or does it deliver on the promises laid out in the campaign? Should it be on your radar? 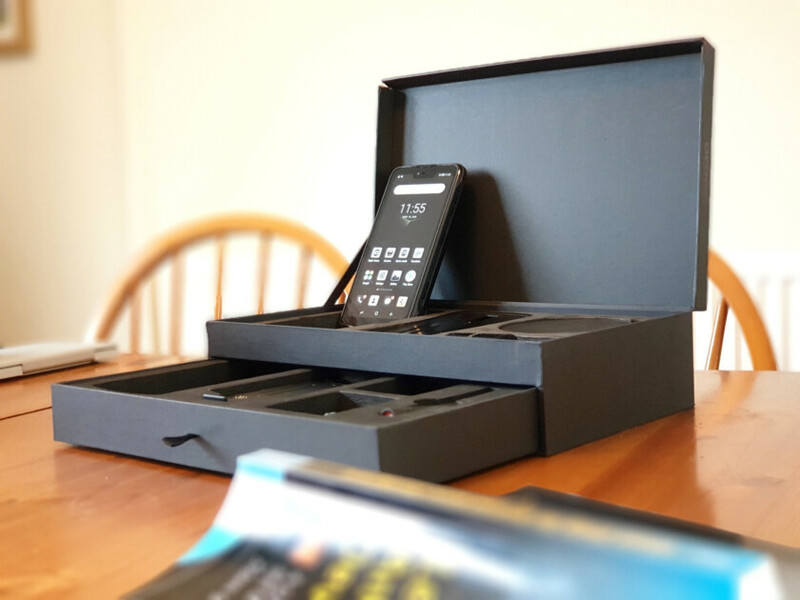 Let’s take a look in this Doogee S90 review. 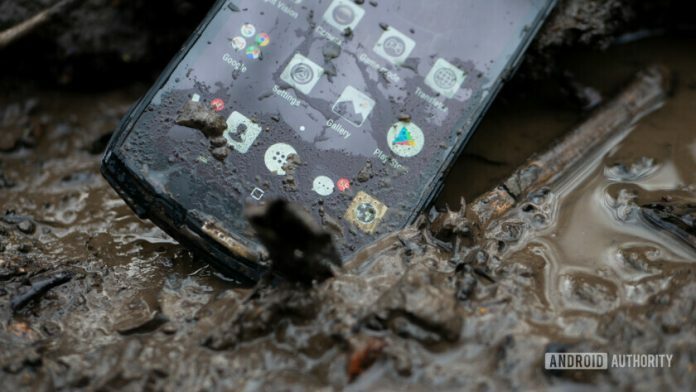 So, this is a phone for adventurous types who want something that can adapt to challenges as they’re hiking through the wilderness, or while they’re camping under the stars. 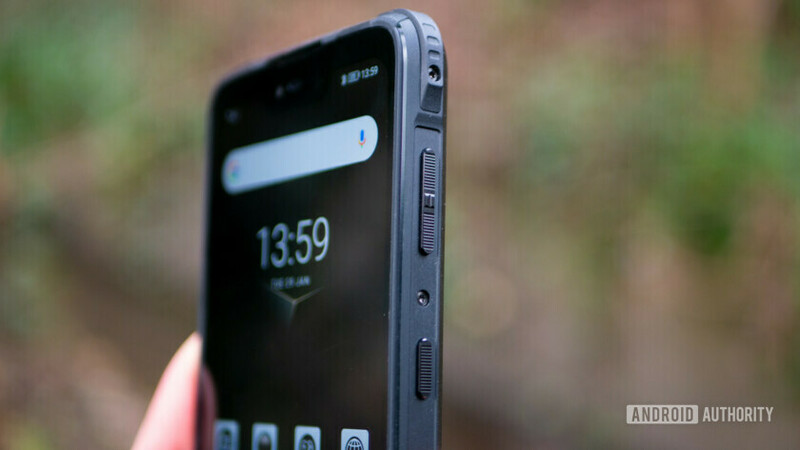 To that end, the Doogee S90 is built like a tank: with old-school flaps covering all the ports, thick rubber bumpers adorning each corner, and visible screws all over the place. It can survive being submerged 1.5 meters in water for up to two weeks. It actually comes with IP69K certification, meaning it can stand up to high pressure steam jet cleaning. And it complies with the US military standard MIL-STD-810G (oh that one). It’s even freezeproof. 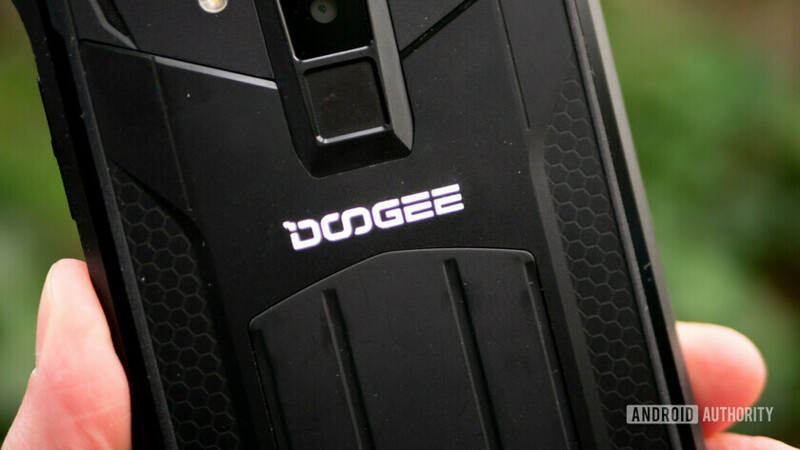 Unfortunately though, Doogee chose to go with Gorilla Glass 4 for the screen, which isn’t even the latest. A screen protector will fix that, however. On top of that, the S90 also comes with a number of cool add-ons that attach fairly seamlessly to the back panel. Kind of like Motorola’s modular components, but also not. As for specs, the S90 packs a middling MediaTek Helio P60 processor, 6GB of RAM, expandable 128GB storage/dual SIM, Android 9.0, a huge 5,050mAh battery, a 16MP+8MP dual lens rear camera with AI smarts, an 8MP front camera, and a 6.18-inch IPS FHD+ display. There’s also a dedicated camera button and a custom key, which I deeply approve of. There’s also a fingerprint sensor, a barometer, face unlock, and some more fun stuff. No headphone jack though! There’s such a lot to unpack here – both literally and figuratively – that I’m really not sure where to start. Also, the box comes with a puzzle. Nope, I don’t know why either. 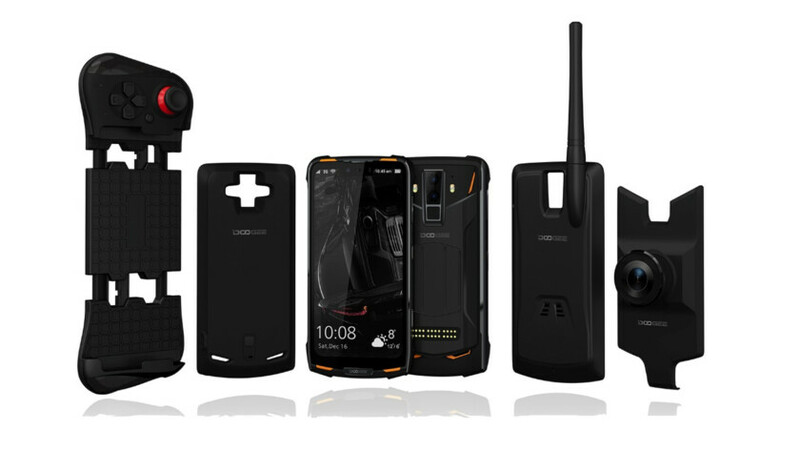 The hope is that Doogee has found an actually practical benefit for the inherently appealing concept of modular phones. If it can accomplish that without sacrificing general performance and design too severely, then we might be onto a winner. 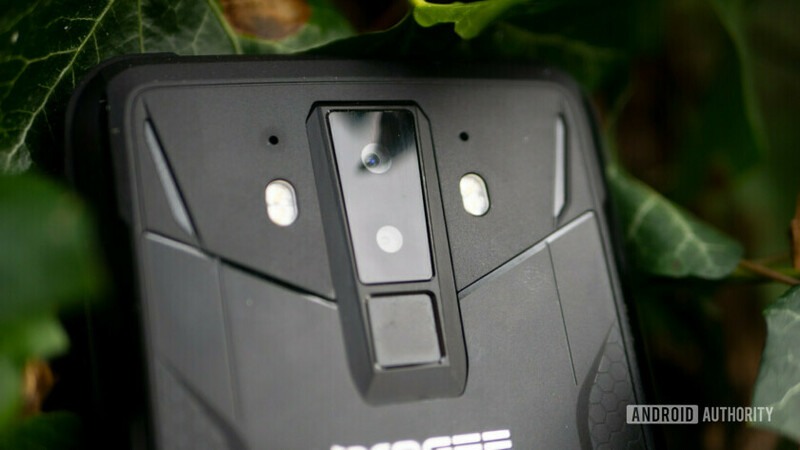 Design-wise, the Doogee S90 of course needed to make some compromises. This is not a looker in the traditional sense that something like a Galaxy phone is. But to be fair, it does have its own kind of rugged charm. It stands out from the crowd — which is always a big win in my book — and it has a few nice details like a hexagonal pattern along the back to help it feel a little more high tech. The visible screws likewise feel as though they’re supposed to be there, and ultimately add to the whole aesthetic. The 24-contact pogo-pin connector for the modules feels a little more out of place though. It makes it incredibly quick to swap the modules in and out, but it would have been nice to have some kind of cover to hide it. The heft of the thing makes it nigh impossible to use with one hand — and this is coming from someone who has no problem using a Galaxy Note 9 that way. Likewise, peeling back those flaps gets old quickly and it’s easy to mistake them for buttons when you’re groping around blindly. It takes a bit of time to develop muscle memory for this one, and, as a daily driver, I imagine it would drive some users a little mad. If you have small hands, or small pockets, then unfortunately the S90 probably isn’t for you. It can get a little uncomfortable in a regular pocket even. But it’s also only fair to point out that, with a phone like this you probably won’t need a case. And that does somewhat close the gap between this and other devices. I know people who add very bulky cases to their phones anyway – such as people who work in construction. To that crowd, having this kind of protection built-in actually makes a lot of sense. And the same goes for those that are constantly hiking/climbing/quad biking. Having a custom button does also go a little way to remedy the unwieldy nature of the S90. Even sweeter is that you can program the button to respond differently to a single click, double click, or long press. Most people will automatically set custom buttons like this to launch their camera app, but seeing as the S90 also has a custom camera button, that opens up a huge amount of customization. You can also use the custom button to launch the underwater camera mode, which is another feature you could feasibly imagine a wild-swimmer type enjoying. Having a custom button does also go a little way to remedy the unwieldy nature of the S90. Unfortunately, the customizable button had some issues. In the beginning it didn’t work 100% of the time, which could prove to be a problem if it happens at the least convenient moment (and of course it will). After a while it stopped working completely. This could be a fault with my model, but it’s worth mentioning. I haven’t drop tested the phone, or left it in the freezer, because I’m not a psychopath. And it certainly looks and feels like the Doogee S90 could take a few harder hits. In that regard, the design is fit for purpose but won’t be to all tastes. So how about those modules? How useful are they really? 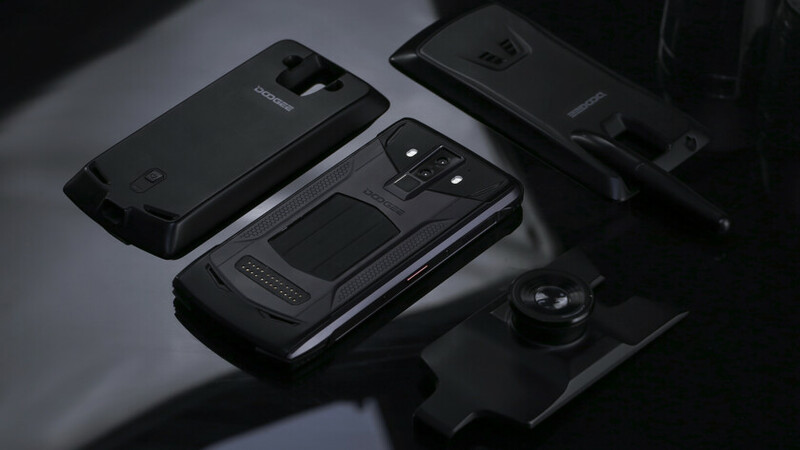 It’s actually possible to order the Doogee S90 separately for $300 and then buy individual modules for between $30-$60, so if you only like some of them, you can save yourself some cash. That said, the entire package is also quite good value at $450. For the most part, the accessories I got to try work as you would expect. The wireless charger is pretty good and works well with the 10W wireless charger supported by the S90. The only limitation is that you can’t charge the massive power module this way (see below), meaning that you will need to plug in if you want that extra juice. Fortunately, the power module has its own USB-C connector, meaning that you’ll be able to charge it separately. Speaking of which, the power module will provide you with a huge amount of total power. Given that the phone had a 5,050mAh battery to begin with, that means that you get over 10,050mAh, when everything is filled up and connected. That’s an insane amount of juice and it would indeed be ideal for any long excursion. It does need to be turned on separately though, which might lead to a little confusion. Obviously, this adds significantly to the already-large footprint, so this isn’t likely how you’re going to be using the phone day-to-day. The night vision camera though was a significantly bigger disappointment. 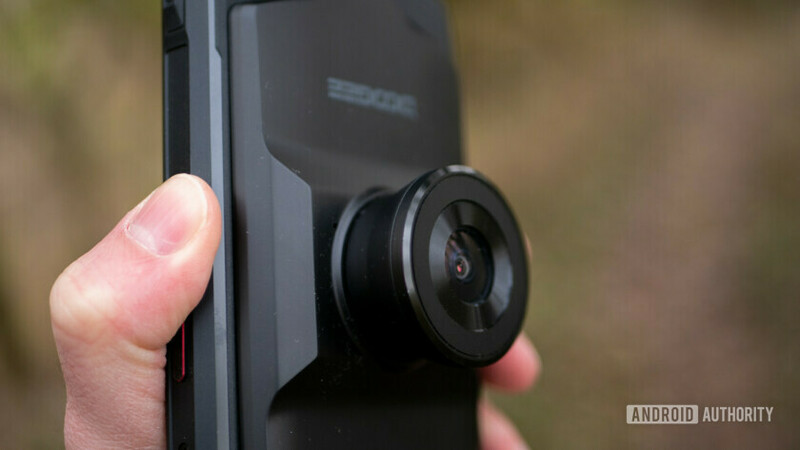 It looks so impressive – adding a huge lens to the middle-rear of your phone and completely circumventing the main dual-lens set-up. But unfortunately, the performance just doesn’t seem worth it. Is it better than the regular camera in low-light settings? By a long shot. 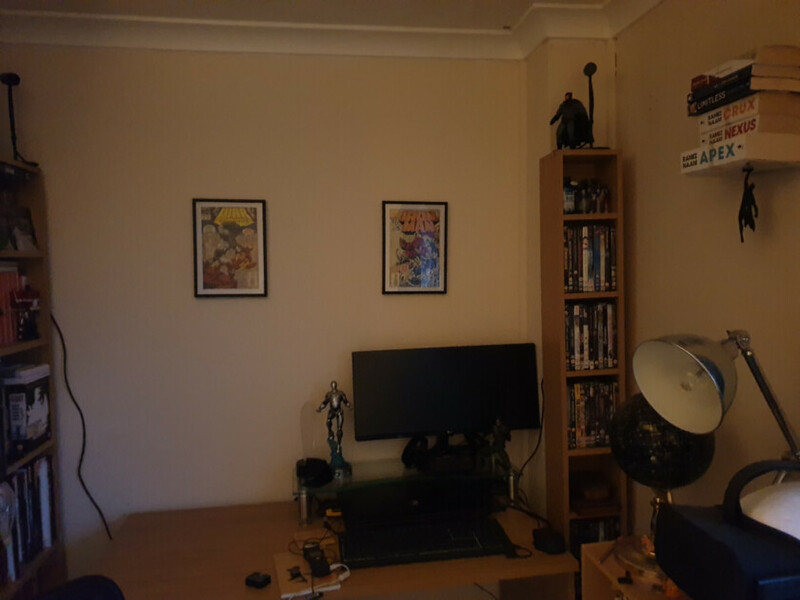 Is it better than my Galaxy Note 9 in low-light settings? Not so much, or at all. It also adds a very noticeable fish-eye lens effect and drastically decreases the resolution. It seems like a lot of effort for not much pay-off. 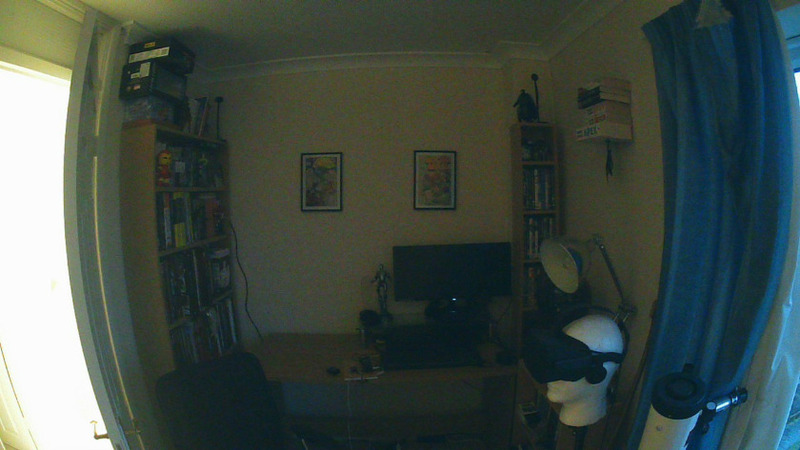 Here is a picture of my office using the regular camera in low light. Not good right? It’s fun to play around with, but ultimately very unimpressive and I wouldn’t recommend paying any extra for it. Note 9 on the left, Doogee S90 with Night Vision module on the right. The walkie-talkie meanwhile is a great idea, but not something I’ve been able to test. 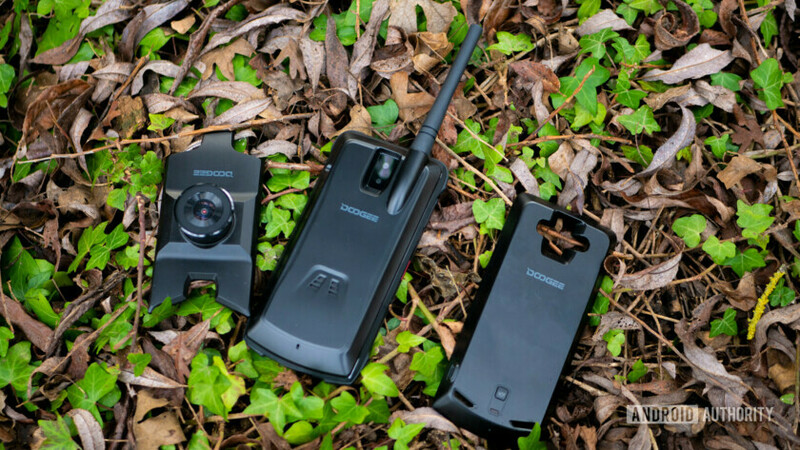 You’d need someone else to also have a walkie talkie, or ideally another Doogee, and that seems kind of unlikely. I guess if you were going on a big expedition with funding, then you might opt to all invest in the same tech. But under those kinds of circumstances I suspect there is more impressive specialist tech available. It has a 6-10Km range, and covers 400-800MHz frequencies. A little unfortunate, is the fact that using any of the modules will disrupt the compass and GPS – presumably due to the use of magnets. This wouldn’t be a huge deal were it not for the intended audience of this phone. While they might not be perfect, the added modules are cool and will certainly be useful for some people, some of the time. While they might not be perfect, the added modules are cool and will certainly be useful for some people, some of the time. The good news is that they are very quick to attach and remove thanks to the magnetic clasp, and I never really had any issues getting them to work. On the whole, what is here makes sense given the pitch. 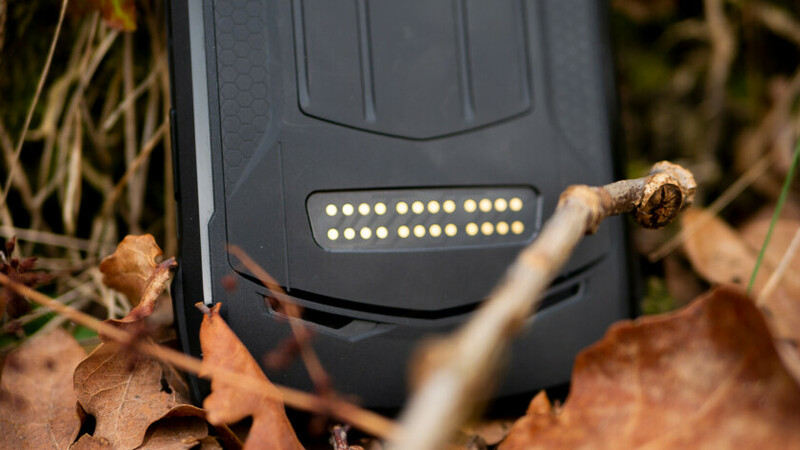 The battery pack will of course be incredibly helpful for those going on long walks or camping trips. Likewise, the walkie-talkie will be useful for communicating in areas of low signal. And if you’re an adventuresome type (yep, that’s a word), then there’s a better than average chance that you’re going to want to shoot some snaps of your surrounds in less-than-ideal lighting conditions. As for how they perform, I’ll get to all that in a moment. But the gamepad? I can’t say I really get the logic of that. It’s a nice idea. It certainly looks well designed (though I haven’t been able to test it). And it’s a common feature on modular phones. It’s just a little off-brand in my opinion, especially as the MediaTek Helio P60 is no exactly a powerhouse chipset. Just as the Doogle S90 design won’t appeal to everyone, the specs also seem tailored for a particular use case. In particular, the S90’s middling CPU isn’t going to win any awards, but it’s fine. It will handle something like PUBG on medium settings okay with occasionally frame rate drops. Its Antutu score was 131,988, beating 40% of users. That said, the hardware is perfectly adequate for most general tasks. You’ll have no problem swiping around the navigation or browsing the web. Ultimately, adventure phones don’t typically need the very fastest performance. 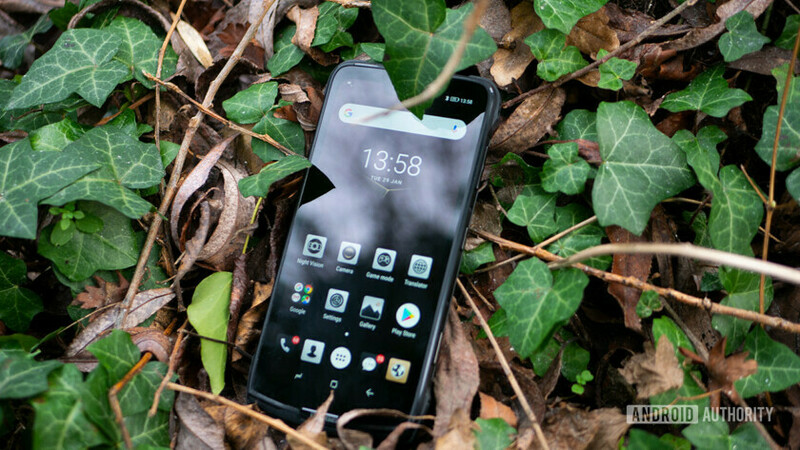 It does slightly diminish the appeal for those that were initially attracted to the Doogee S90 for its high-tech looks. It’s less attractive to early adopters as a result, and it’s slightly less appealing as a daily driver too. 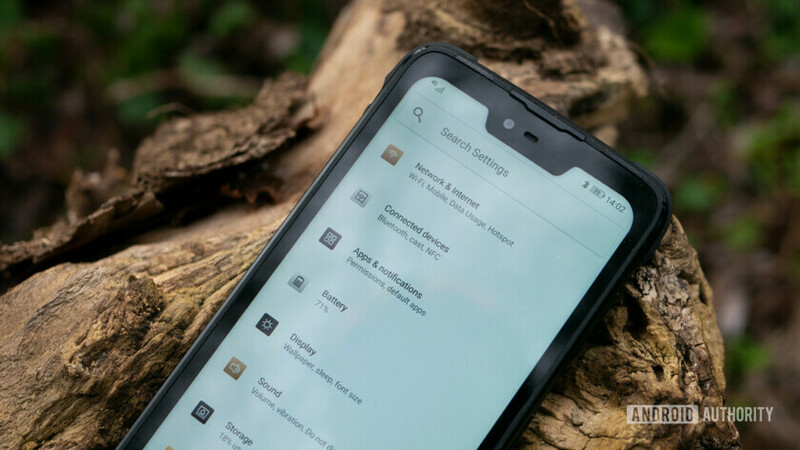 The software experience is built on Android 8.1.0, though there are some customizations around the settings menu and the like. Some might find a few of the design choices here a little garish. There’s a black, grey, and bronze color scheme throughout, which is okay I guess, but gets a little bit much when there are large icons all throughout the menus. This is especially true as they’re old-school, skeuomorphic designs. The good news is that some of the features that have been added are pretty cool – there are lots of gesture control for instance, and a one-handed mode (which didn’t really help me, but maybe it will help you). The preloaded apps are also neat and take unique advantage of the hardware. 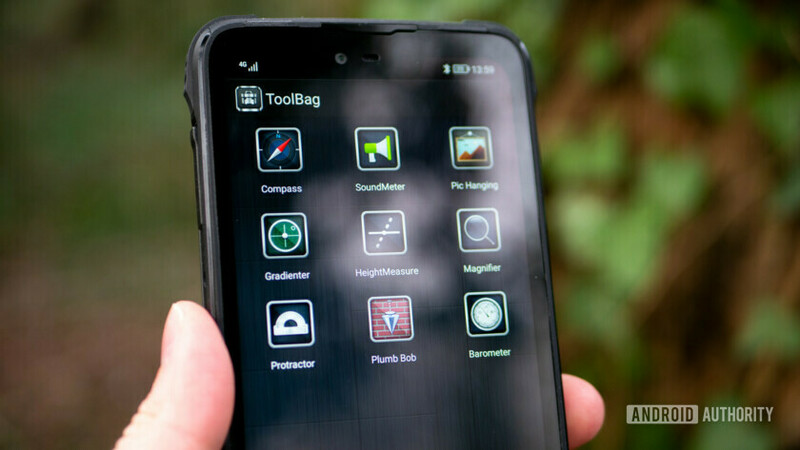 You have a Toolbag app for instance which gives you access to things like a calculator, picture hanging tool, barometer, and more. 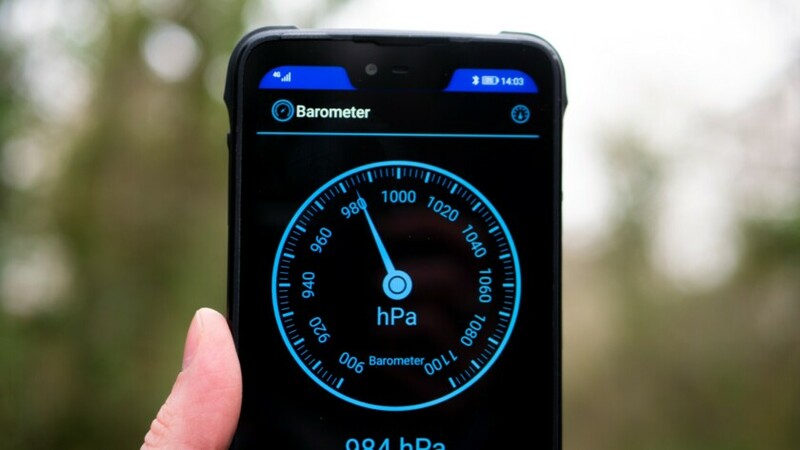 Obviously, some of these apps take advantage of the additional sensor: the barometer. Less welcome are the dreaded duplicate apps. There’s a second browser for instance and a gallery app. It’s pretty annoying that big OEMS like Samsung are still doing this. 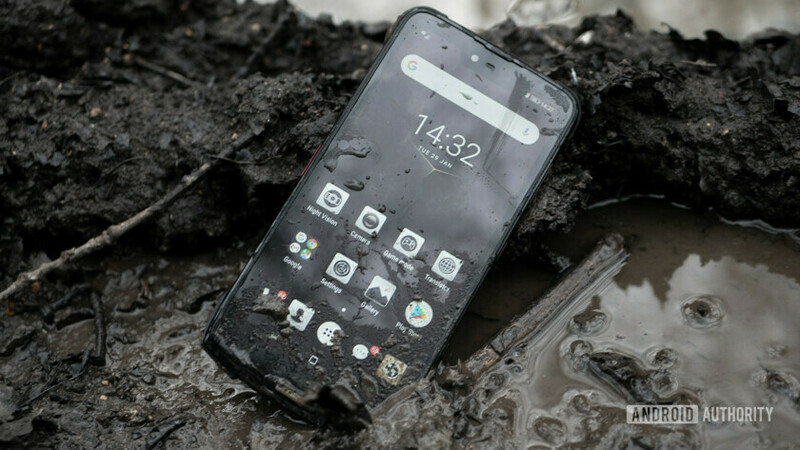 It makes even less sense coming from a small company like Doogee. And nope, you can’t uninstall. The Toolbag app is neat. The same can’t be said for the additional browser. There are occasional glitches in the software. Sometimes apps would open randomly. Sometimes I think this was due to me accidentally touching the custom key while it was off. But it would sometimes happen when I could swear I hadn’t touched it. And sometimes it would open into apps that don’t allow use of the on-screen navigation buttons, so I’d be stuck and it would be a pain. This would be especially problematic if you were up a mountain and trying to quickly find the route home/snap a photo of something. As with the design itself, there are some very cool additions here, and some frustrating misses. Which ring the loudest for you will again depend on the type of user you are. This was the area I was most wary of going into this. While $450 might price this as a mid-range device, when you consider all the accessories you’re getting, and all the unusual designed elements, that doesn’t leave a big budget for fancy specs – hence the CPU. 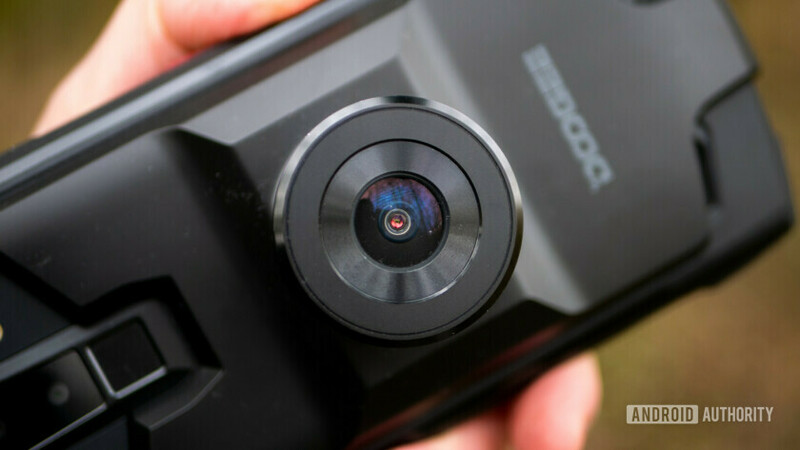 And when it comes to less-expensive smartphones, the camera is almost always what suffers most. This could be a problem for a device designed to come with you on adventures to spectacular viewpoints. So, is it good news? Not really I’m afraid. The camera does reasonably well indoors when taking photos of subjects. 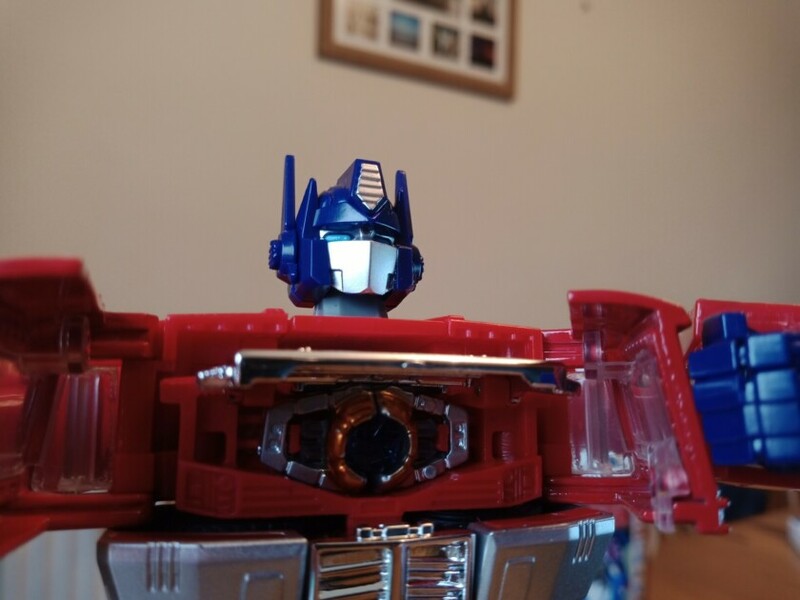 Images came out punchy enough, and while there are no bokeh effects despite the dual lenses (that I could find), you do get a pro mode and the option to control the aperture. Take it outdoors though and things fall apart a little. It’s not terrible, but photos look very washed out compared with more capable shooters. 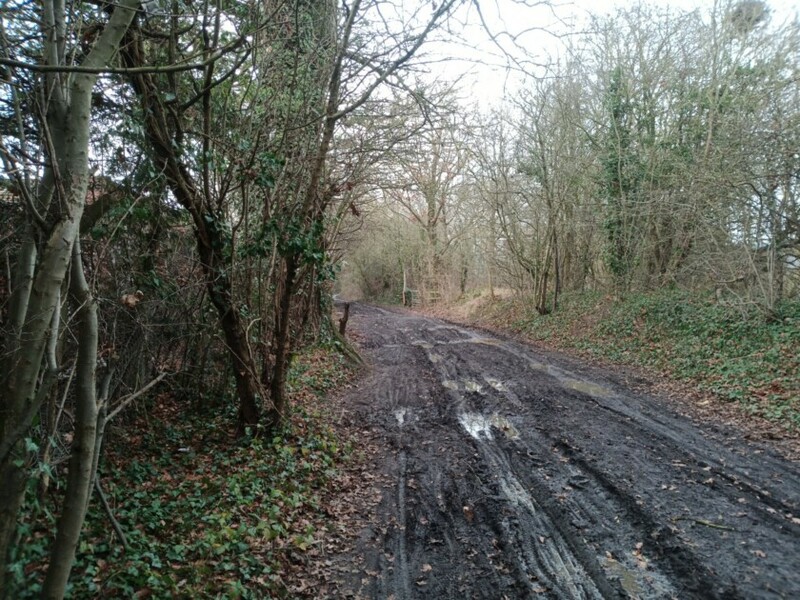 A bigger issue is the exposure and dynamic range – with many photos coming out with bright white skies. Detail is middle-of-the-road, as you might expect from the middling pixel count, and there is a little over-sharpening. The f/2.0 aperture is also a little disappointing. A very bland looking shot. Though to be fair, it was a bland day. More full-size photos can be found here. 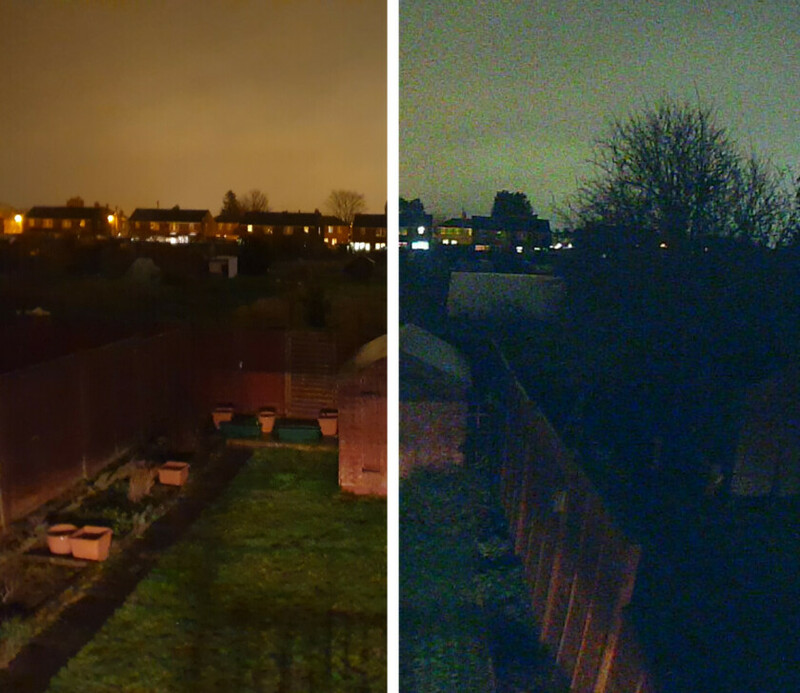 As mentioned, the Night Vision module doesn’t do much, which is probably the biggest disappointment here. 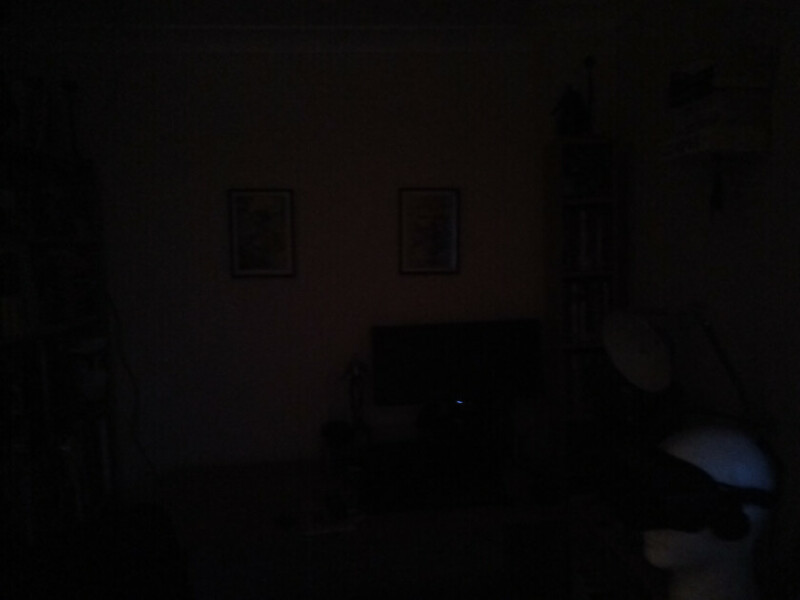 Unfortunately, the regular low-light performance is also abysmal, as we already saw. Again, potentially an issue for those that like exploring. There is a dual LED flash though, which might help in those low-light settings. It’s not a complete disaster, but if I were to finally reach the summit of a great climb, I’d definitely want to pull out something more impressive to grab my photos. Bring a camera! How sad am I to have to give it back? How eager am I to get back to using my own daily driver? What makes things a little tricky here, is the fact that I was very sad to give it back, but also eager to stop using it. I guess that means that this device is fun, and useful to have around for specific circumstances, but ultimately not highly practical or polished. Yep, that about adds up. 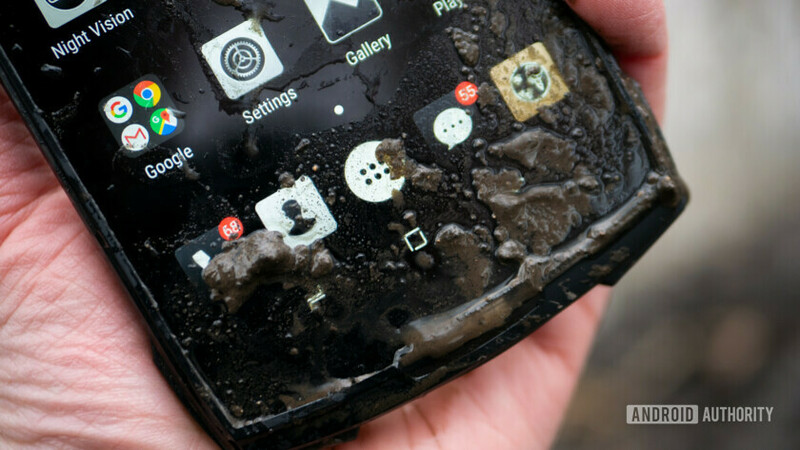 There are a lot of people who won’t want this phone. If you’re looking for top of the range specs, the best camera, svelte looks, or something that you can easily slip into a pocket – then keep looking. 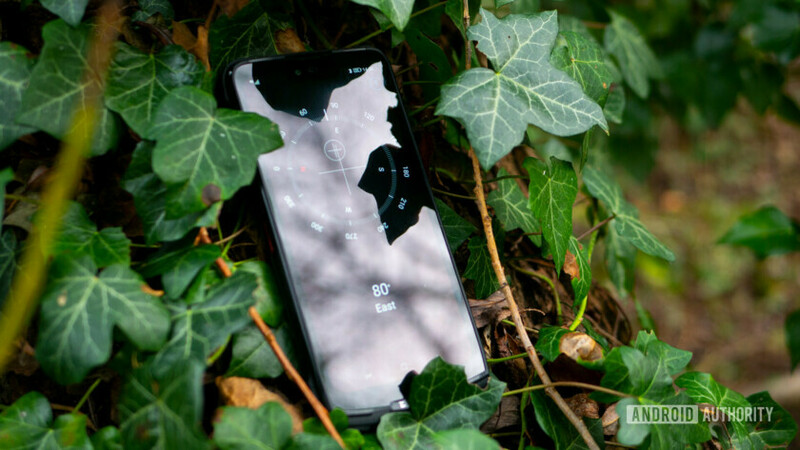 But there’s also definitely an audience for the device, and I would happily recommend it to those people – as long as they are aware of the shortcomings and caveats. I’d also advise against paying full whack and instead maybe just choosing the phone, battery pack, and possibly walkie-talkie. And ideally it would work better as a secondary device. That applies to people who go on lots of long hikes, rock climbers, skiers… but also construction workers (who will also potentially benefit from the height measure tool and the like) or super-spies. Do keep in mind though that there are plenty more rugged phones out there, if that’s all you need. The phone really is fun to use and play around with. It feels like something James Bond would use. The phone really is fun to use and play around with. It feels like something James Bond would use. And I enjoyed this review more than any in recent memory. At the same time, it’s hard not to think immediately of some of the missed opportunities. Like, wouldn’t it be cool if the screen would let you operate it with gloves? Though to be fair, the custom button can be used for much the same purpose. Also: Gorilla Glass 5? Likewise, it would have been really nice to get a wide-angle selfie-camera for those “I’m on a mountain” photos. How about a solar charger? But I guess the fact that my mind is going to all these places does suggest that the concept at least is interesting. I like how tailored toward a specific market this thing is, and I love the idea of building more phones geared toward particular groups of people. We have more than enough vanilla phones.